With its diverse collection of more than 200 industrial artifacts, including over 20 artifacts from the Smithsonian Institution’s collection, and a variety of oral histories and interactives, the National Museum of Industrial History provides a unique educational experience in a sensory rich environment. Educational programming meets core curriculum standards for STEAM and Social Studies and offers opportunities for hands-on learning with authentic objects and specialized programs. 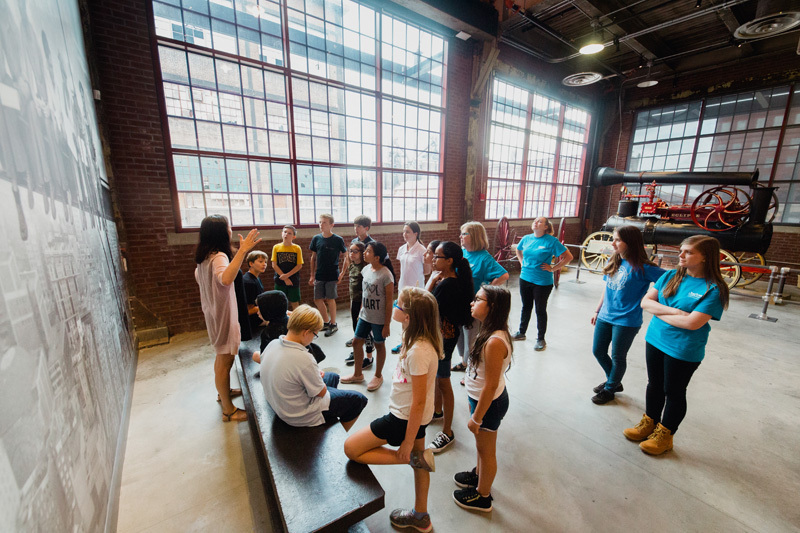 Museum educators and trained volunteers engage children in lively, inquiry-based conversations that offer deepened contextual understanding of science, technology, industry and local history and encourage important skills like critical thinking and evidence-based reasoning. NMIH educational programming is designed to help participants find new ways to explore the complex industrial past, to ask questions that help them understand the present, and inspire them to generate ideas for the future. You can help inspire the next generation of inventors and achievers in your community. Support the Future Innovators Fund today. Contact the Development Office at 610-694-6636, mpildis@nmih.org for more information. *Schools qualifying for Future Innovators Fund field trip support serve student bodies in which at least 40 percent of its students qualify for free or reduced-price meal programs. School field trips are available from grades 5 through 12.